The Statue of Unity is a symbol of pride for every Bharatiya. It is dedicated to the iron man – Sardar Vallabhbhai Patel – who united the various provinces, kingdoms and states after independence to give shape to the united Bharat we know today. This tall leader deserved much more respect and acknowledgment for his efforts towards a united Bharat, but his legacy was purposely suppressed by the very political party he served with such distinction, just to ensure he didn’t eclipse the Nehru-Gandhi dynasty. 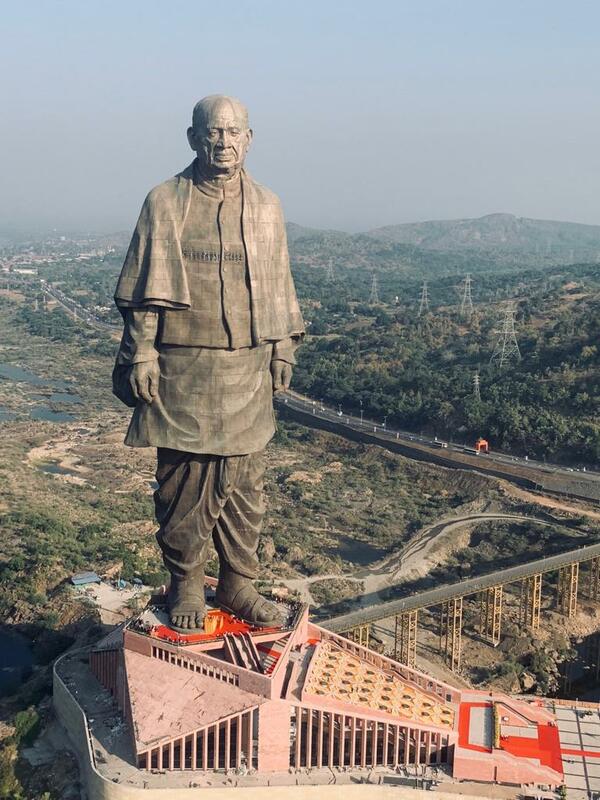 While the liberal brigade in Bharat is busy ranting that this statue was ‘unnecessary’, die-hard imperialists in the West also seem shocked over how Bharat could achieve something of this grandeur. Statue of Unity is the world’s tallest statue, about two times as tall as the famous Statue of Liberty in USA, and has already drawn over 1 lakh tourists in the few weeks since its opening. Even in the past, Bharat’s success in fields like space exploration has not been digested well by Western powers like UK. 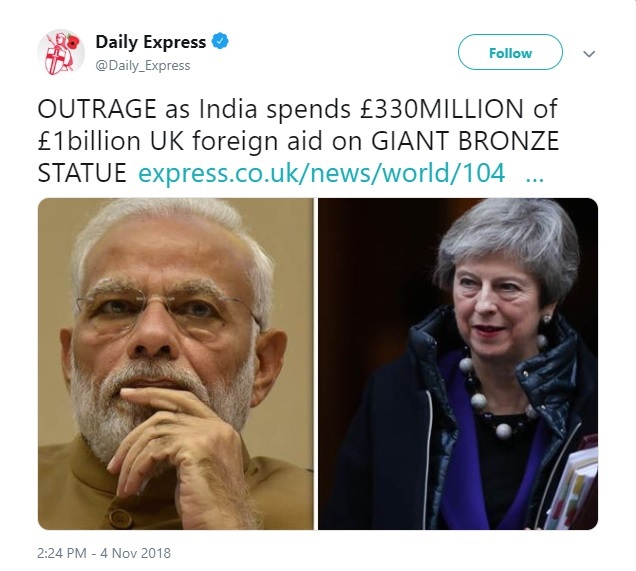 So it was not entirely unexpected when the British press decided to outrage over an ‘aid-receiver’ like India spending money on building such a humongous statue. The Daily Express report accuses Bharat of spending millions on building the world’s tallest statue while accepting over £1 billion in aid from UK during the period 2012-18. Bharat has quietly transitioned into the role of provider, as in the last three years it has given more aid to foreign countries. “Bharat is currently a net donor of foreign aid. In the last three years, Bharat has provided more aid to foreign countries, than it has received,” informed Minister of State for External Affairs General VK Singh in March, 2017 in a written reply to the Parliament. In the financial year 2015-16 Bharat gave Rs. 7719.65 crores as aid whereas it received Rs. 2,144.77 crore in aid from foreign countries and global banks. Its neighbourhood is the biggest recipient of aid from Bharat in sync with New Delhi’s “Neighbourhood first” policy – Bhutan, Afghanistan and Sri Lanka have been the biggest beneficiaries. So what is being called ‘aid’ to Bharat, is actually grants made by Western Governments to international NGOs (some with evangelical connections) which subtly promote foreign interests under the facade of universal causes like social justice and human rights. The recent anti-Sterlite agitation in Tamil Nadu which severely dented Bharat’s copper production, shows how this murky world of ‘international activism’ works. UK’s international ‘aid’ is routed through its Department for International Development (DFID) government agency. As per DFID, it ended ‘traditional financial aid’ to Bharat in 2015, and since then has focused on sharing skills and expertise and making private sector investments which will help the poor and generate returns for UK. Its clear that DFID is not doing any charity, but partnering with Bharat for UK’s own long-term national interests. As for DFID’s traditional grants and aid to international NGOs involved in ‘social causes’, the use of this money is dodgy at best as the Oxfam Haiti prostitute scandal cover-up showed. DFID also funds controversial #BreakingIndia groups like World Vision, Centre for Alternative Dalit Media and others. So its a wise move if DFID has now shifted its Bharat partnership focus to joint economic development and job creation in both countries. Government agencies like DFID, USAID, IDRC (Canada) etc. should completely stop meddling in socio-political affairs of other sovereign nations under the guise of social justice, human rights etc. As Gujarat chief minister, Modi had announced the project in 2010. As mentioned on the Wikipedia page, the statue was built on a Public Private Partnership model, with most of the money raised by the Government of Gujarat. The Gujarat state government had allotted ₹6 billion (US$84 million) for the project in the budget from 2012 to 2015. In the 2014–15 Union Budget, ₹2 billion(US$28 million) were allocated for the construction of the statue. Funds were also contributed by PSUs under CSR scheme. The Sardar Vallabhbhai Patel Rashtriya Ekta Trust (SVPRET), a special purpose vehicle set up by Modi in 2011, arranged some 129 tonnes of iron implements from nearly 100 million farmers in 169,000 villages across all states to construct the base of the statue in the ‘Loha’ campaign, reports India Today. The statue is situated on a scenic island and its surrounding environs are being developed into a tourist hub – 1.28 lakh people visited the statue in just the first 10 days of its opening. So even from a strictly commercial perspective, the Statue of Unity could easily recoup its initial investment in coming decades and boost the local economy. Bharat has emerged as the second-largest international job creator in the United Kingdom (UK) after the United States (US). According to UK Trade and Investment (UKTI), in 2016-17, a total of 127 foreign direct investment (FDI) projects were set up by Bharatiya companies in the UK. These generated 3,999 new jobs, besides safeguarding the exiting 7,645 jobs, reports India Today. The immeasurable harm done to Bharat by British colonization is far-far more than the ‘aid’ Britain claims to have provided independent Bharat. The riches of contemporary Britain are in large part due to the resources they plundered from Bharat, and many of their ‘noble Lords’ today are nothing more than robber barons who generated their wealth by exploiting people in British colonies. 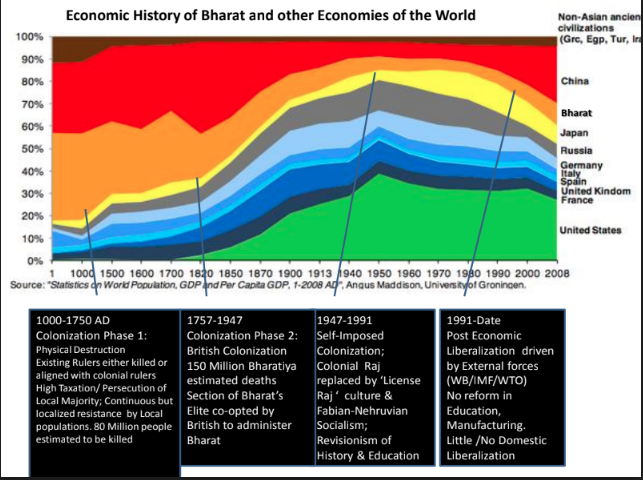 As per research conducted by Prof. Angus Maddison on the history of world GDP, Bharat contributed a whopping 35% of the world economy around 1000 CE – but its share plummeted drastically due to invasions and subsequent colonization, with the period of British colonization being especially brutal & leaving the country with a paltry < 5% of global GDP share at the time of Independence. The real matter of debate is when Britain will repatriate the colonial-era loot such as the Kohinoor diamond still shamelessly kept by the British royal family as part of its ‘crown jewels’, and the hundreds of invaluable temple murtis stowed away in British museums and private collections. An unreserved apology by the UK Government for 150+ years of brutal colonial rule and incidents like the 1919 Jallianwala Bagh massacre would be a civilized start. Just like German society has come to terms with Nazi Germany’s role in the holocaust, British society too needs to end its denial and educate its citizenry about Britain’s colonial crimes. 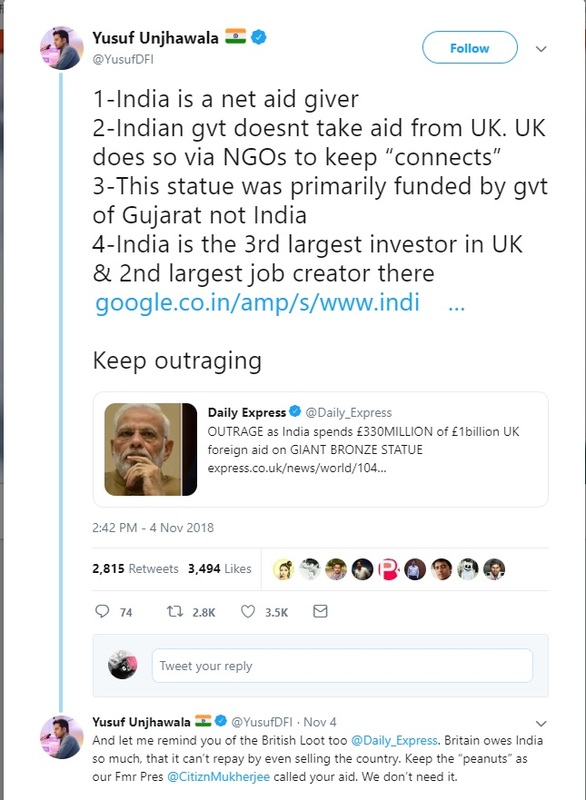 But in a way, this colonial-era outrage over Bharat ‘splurging aid money on a statue’ is good if it leads to a complete stop to such ‘aid’ coming from Western governments and NGOs through the FCRA route, which is nothing but a tool of Western foreign policy aimed at exploiting Bharat’s social fault-lines and preventing its rise on the global stage. “Modi is Anti Dalit”, a Colour-Revolution-style Big Lie…Instigating Caste Wars!